We all know how important clear goals are to management. We sometimes forget they’re not enough. If you want an employee base that brings their best, they need more than goals – they need access to resources, and they need to be able to perceive their own progress along the way. In this webinar, award-winning author Ed Muzio (Iterate: Run a Fast, Flexible, Focused Management Team) will explain how clear goals, control of resources, and self-managed feedback combine to create what’s known as Front Line Self-Sufficiency. When you get it right, your front line will be able to tell management how things are going, instead of the other way around – and your company will make better decisions because they’ll have better information. A must for front-line managers and middle managers alike, understanding the concept of Front Line Self-Sufficiency is the first step in getting managers out of the handholding business, and into the business of directing the organization. 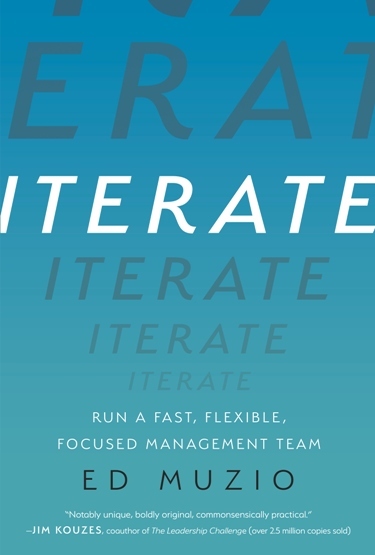 Attend the live webinar and we'll enter you for a chance to win one of two copies of Ed Muzio's new book, Iterate. Winners will be drawn & announced at the end of the Nov. 14 webinar. A regular guest on CBS, Ed works with Fortune 500 leaders and managers, individual practitioners, and everyone in between. He has been featured as a workplace dynamics expert in international media ranging from Fox News and The New York Post to Spirit Magazine and Monster.com.